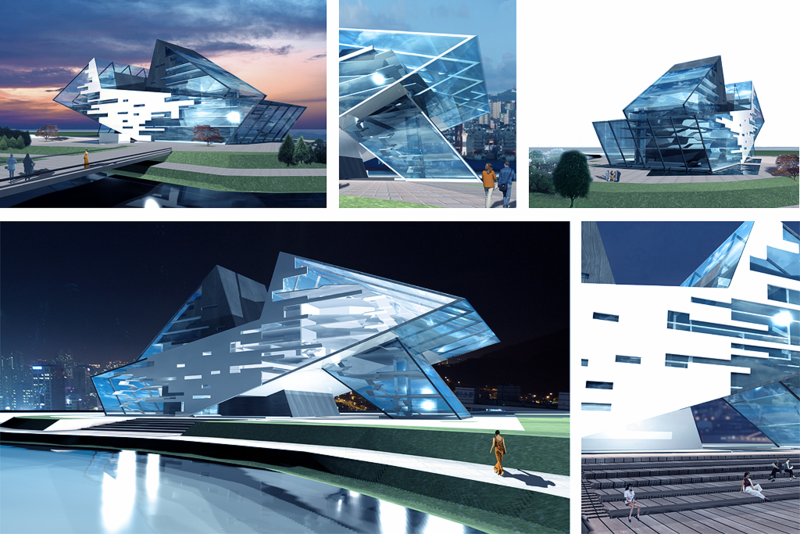 In the summer of 2011, Radiant Partners team developed a proposed design for the new Opera House in Busan, the 2nd largest city in South Korea. The city of Busan occupies key place in international sea transportation and serves as a convenient gateway to the Pacific Ocean, being situated at southeastern tip of the Korean peninsula. Port city has excellent connections with southeastern costal turism beltway and busiest commercial sector of Busan. Designated site for Busan Opera House is part of North Port redevelopment plan, which has main three goals: establish an international gateway to connect the Pacific Ocean and the Eurasia continent; link and develop the northern seaport to the surrounding areas to stimulate the local economy; establish the city as the center of maritime tourism and build up the international significance. North Port site is set to provide significant public space, easily accessible to all citizens, emphasized with island style landmark. Pedestrian routes and plazas along changing picturesque scenery, sea and city views are to be established for recreation and public events purposes. Also North Port redevelopment plan includes commercial and office district, integrated downtown district, IT video exhibition district, and maritime culture district. The aim, while forming conception of building, was primarily to create iconical entity for modern metropolitan city, and building, representing multicultural node, which would be able to diffuse and propagate culture. The structure would be one of the cultural life centers, and bring particular spark of life to surroundings, both social and urban. Planned multicultural spaces would integrate art, music and literature into theatrical function. Particular spatial configurations of urban landmark were also considered, as the structure has to be visually significant and dynamic in background of high-rise residential and office buildings and ocean view. Based of inspirations and analysis of both site and urban context, iconic, distinctly expressive structure was proposed, which in its unique form would play the role of much needed landmark, perceived equivalently yet unexpectedly from all possible points of observation. It will affect the environment as distinct sculpture with many symbolical meanings. The theater structure was inspired by symbols closest to the country and designated harbour site – classic Korean ship and its most defining feature, dragon head on the bow of the vessel. Its former meaning to „strike fear“ is being reinterpreted into „strike excitement“ with replacing dark materials and sulfur smoke with transparent glazing and bright lights and keeping same dynamic and forward streaming spatial forms, which also signify constant movement, so characteristic for performing arts. The sharpness and colision of building planes symbolize importance of human questions and problems that are being expressed by performance art. A theater reflects the true nature of the human being, and human being is made of acute questions – and designed structure strives to emphasize that particular feature. Symbolic meaning of human duality is represented in two intersecting volumes of the building, flytower structure cutting into main body and reminding of hoisted sail. The site landscaping around the theater is formed to follow the terrain form and set pedestrian paths, incorporating them to fluid routes. The plaza with reflecting pools is projected as a continuity of surrounding water landscape. Main entrances is oriented to main visitors‘ flows from future bridges. The main compositional axis of the building is conforming with present urban axes, maintaining fundamental planning idea intact. Sharp and defined volume of designed bulding helps to convey the image of exclusivity and also corresponds well with free planning morphology of the site. The structure’s clarity is emphasized by different materials, used for facade planes and strategically placed window zones. Blind facade planes interchange with clear glazed window zones and planes, creating emphasized contrast and characteristic texture of volume, also representing underlying symbolical meanings of lighter and darker sides of the human soul. The whole volume of structure responds well to practical function of the building as all parts of building were designed with specific functional as well as aesthetic aspect in mind. Considering the possible scale of such a facility, sensible decision to separate functions into different volumes was made, thus enabling building to become lighter and tear off from the ground. This decision created certain lightness and unblocked the visual lines of pedestrians‘ paths as walkers by now are able to see through the structure and not to lose orientation, which inevitably might happen when visual path is blocked. The grand flytower of opera house structure cuts into main building form, reminding of hoisted sail and creating contrast in facade materials and volumetric forms. The smaller flytower of universal theater is incorporated in north side of the building. Main opera house lobby, universal theater lobby and high-end restaurant are strategically situated in open spaces with scenic views of both Busan city and ocean. Considering the possibility of different events taking place at the same time and distributing respective visitors’ flows, opera house (1920 seats) and universal theater (1276 seats) are positioned at different building levels with separate entrances, lobbies, utility premises and buffets. Also facility includes convention center with separate entrance, public cafe, high-end restaurant with scenic views of Busan cityscape and ocean, gift shop. All public areas and facilities are adapted to disabled and elderly people‘s needs, including, but not limited to elevators, access ramps and other necessary equipment. Universal theater‘s hall is designed for transformable seating arrangements with permanently installed floor section hydraulic systems, suitable for dance/concert/drama performances. Initially set as theatre-in-the-half-round, auditorium can be transformed to any needed arrangement. Main lobbies of opera house and universal theater take up to several levels, distributed along halls‘ volumes. Buffet zones, actors’ foyer, areas for representative and festive functions are foreseen in foyer’s balconies. Opera house stage and universal theater stage have direct access to scene set production and montage premises. Both stages are equipped with cargo elevators which dimensions enable comfortable delivering and montage of stage sets from delivery area. Cargo elevators have direct access to delivery, storage and production area. Utility and production premises are positioned in the back of stage areas as well as service ramp and covered auxiliary yard. Production area also has direct access to service ramp and auxiliary yard. The separate access to administrative premises, planned around open atrium with second light, is designed, with separate elevator and staircase. Comfortable and immediate interrelations with spectators’ area, utilitary rooms and repetition halls are retained throughout all the area. Special attention in design process was paid to separate noisy production areas from main scenes’ zones and other spaces. High-end restaurant has separate service staff entrance and supply elevator, accessible from the ground level. The opera performance hall of 1920 seats is shaped as horseshoe, this being acoustically proven most successful form, used in many theaters throughout the world. The ceiling takes its form after shell, also for ensuring necessary acoustical features. All opera house facilities are designed for world-class production. The main stage is adapted for busy theatrical season. Legs and other major scene sets for different performances (framed scenery pieces) are to be held in the left wing of the stage and in the area upstage zone, thus enabling quick and effective change among performances. Opera house is equipped with full-size flytower and all necessary rigging. The stage wings and upstage zone can be closed with soundproof and fireproof curtain walls. Upstage zone can also be used for extending performance area to 28 m deep. Second level, designed in upstage zone, can be used for back projector room. Heavy scene sets are to be transported to storage areas through service hatches using hydraulic cranes. Small glazed boxes for performance director and chief stage engineer are provided in both wings of the stage. Both stages contain orchestra pits. Opera house orchestra pit partly overlaps with stage floor and area reaches to 140 m² which enables to contain full-sized orchestra. Utilitary (changing, rest) rooms for musicians are designed directly behind orchestra pit. Flyloft, reaching to 37.5 m of height, allows to hide backdrops up to 18 m of height. Multi-level galleries are provided around sides and back of stage box, which can be accessed via elevator or staircases in stage corners. These galleries also provide access to stage lighting boxes. Lighting and sound operators’ boxes are placed behind the parterre, under grand balcony. Two boxes for far lighting are located in the corners of grand circle. The lighting and broadcast control room is placed behind the loge in the center. Corners contain sound and light machinery rooms. Universal theater‘s performance hall is equipped with its technical premises and own storage area, stage sets are to be delivered through separate cargo elevator which has comfortable access to the same delivery ramp. The same route is also fit for cafeteria supply deliveries and separate elevator is provided. Make-up rooms, designed for two people, are placed in first and second floors behind the stage area. Big make-up rooms for group uses are foreseen next to second performance hall. First and second floor area also contains rest and meeting with fans and critics zones for actors before and after performances. Enough comfortable space is provided for rehearsals and preparation for theatrical seasons and premieres with orchestra, ballet, universal, grand and minor rehearsal halls with resting and changing rooms next to them. All rehearsal facilities are easily accessible for both theaters‘ staff and performers. Workshops are placed along the structure with comfortable access to montage and stage areas. Suitable sound and fire proofing is ensured. Workshops include: assembly rooms, auxiliary rooms, volumetric stage sets; carpenter shop with drying area; metal-workers’ shop; props; textile stage sets; decorative painting room; textile painting room; volumetric drapery assembly room; painting rooms; tailor-shop, shoemakers’ shop, wig shop; laundry facilities; restoration facilities; photolaboratory. Storage area include large (at least 9m long) stage sets storage; textile and soft drapery storage; props and furniture storage; props; costume storage; seasonal technical reserve storage; stage machinery; reserve storage area; supervisor’s office; orchestra storage area. Proposed construction scheme consists of spatial steel trusses and load-bearing steel roof structure. The main volume of grand flytower serves as stiffness core. Slabs between levels are in-situ concrete on trapezoid steel sheets, supporting structure – steel beams. Overhanging parts of foyers and staircases are supported by attaching them to roof load-bearing structure. Carbon fiber load – bearing joints are used in order to diminish dead loads. Spray fireproofing is used extensively thoughout all metal constructions. Modern insulation materials with wind insulation and thermal glazing will be used for ensuring that thermal losses and conditioning demands would be minimal. The main volume is covered with curtain wall of natural white and black stone, held by system of anodised aluminium profiles. Structural aluminium profile and triple glazing systems are proposed for facade glazing. South facing roof plane is designed for thermal collectors and photovoltaic elements. Prestigious location and function of the building requires special attention to be paid to various external lighting scenarios. Two stages of external lighting are proposed – minimal one for everyday, and one for special festive occasions. First option comprises the lighting of blind facade planes and main entrance mirror plane, executed by projector light fixtures. Special lighting scenario includes iluminated main foyer and performance hall volume, executed by LED lighting fixtures, which also are designed by every window and skylight. The abstract lighting fixtures, made to order, enlivens the decorative pools and main plaza.